March 31, 2017  The shutdown affects a roughly 3-mile portion of I-85, blocking a major artery that runs through the heart of the city. 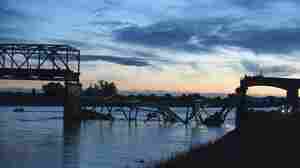 'White Flash And Cold Water' After Bridge Collapse In Wash.
May 24, 2013  After a truck carrying a heavy load struck the side of a bridge that carries Interstate 5 over the Skagit River north of Seattle, the roadway collapsed. No one was killed. Dan Sligh and his wife were in a pickup. "You just hold on as tight as you can," he says of the fall they took. May 23, 2013  TAn unknown number of people and vehicles are in the Skagit River, and rescue crews are looking for them. 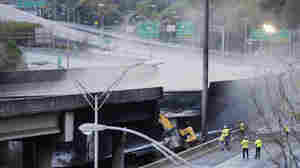 The bridge collapsed at 7 p.m., but the reason is unclear.